Mostly dry. Very mild (max 11°C le Sam soir, min 6°C le Jeu soir). Wind will be generally light. Light rain (total 2.0mm), mostly falling le Mar après-midi. Very mild (max 13°C le Lun après-midi, min 6°C le Mer matin). Wind will be generally light. Le tableau ci-dessus montre les prévisions météo pour Antillanca à l'altitude spécifique de 1700 m. Notre modèle de prévisions météo sophistiqué nous permet de donner des prévisions de neige en bas, au milieu et en haut de la station Antillanca. Pour accéder aux prévisions météo à d'autres altitudes, utiliser l'onglet de navigation au-dessus du tableau. Pour une vue d'ensemble du temps, référez-vous à , la Carte Météo de Chile. I work in Antillanca as a ski/snb instructor all the 2015 season. I had all the best and worst things from Chilean Patagonia. Center is not very big but it has nice pistes of difficulties between green and red level. Haique is a nice FIS certified red slope; races are organized here very often. Cerro Haique is also a nice start point for slack-country slopes called El Lobo and Araucano. Both are nice; fast and long but not very steep runs with plenty of space. 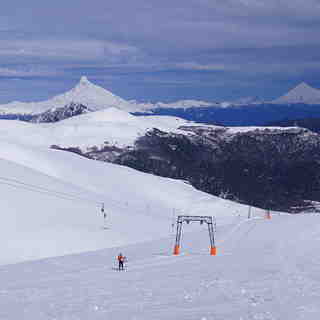 From the top of Don Pedro lift you can enjoy a great view of Volcan Osorno, Volcan Puntiagudo and Volcan Puyehue. It's also a gaze to Antillanca backcountry: Cerro Mirador (30 minutes ski-touring) and Crater of Casablanca (about two hours skinning). 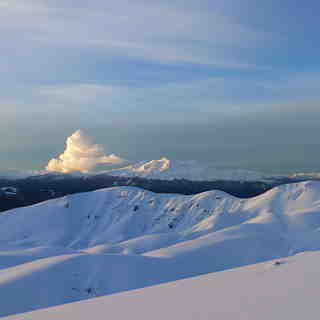 Great views with mostly good snow; Casblanca run is great fun but backcountry is much bigger. As almost everywhere in Chile, you can spend a couple of days camping and ski-touring. I love this place! Bad things? Only one: difficult and unstable weather. It rains very often during the season. Sometimes rains a couple of days with no skiable window. Puelche Wind can be pretty strong too. Yes, this is Patagonia and when Pachamama enters the game, everybody just waits (and write internet comment like me now). Highly recommended but always check weather forecast first! Chilenos disculpen por favor, Español es mi lengua preferida,pero la idea es a ayudar a viajeros de otros países,ustedes saben que pasa aquí!